Tiger Wood's autograph is arguably a highly sought-after item. Those of us who have seen him at tournaments knows that he doesn't sign much. Woods has a deal with Upper Deck to ensure the authenticity of items he does choose to sign. So, if you are Tiger Woods, do you place any value in anyone else's autograph? The answer is yes. Woods asked an Upper Deck official if he ever ran into Sandy Koufax, the baseball Hall-of-Famer, who pitched for the Los Angeles Dodgers, would he get Tiger an autograph. Upper Deck delivered a baseball with a personalized inscription. It actually was Woods' second autograph he coveted. The first was Muhammed Ali. 12 years ago, Woods asked Ali himself for an autograph. 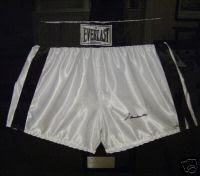 Ali gave him a pair of signed boxing trunks. A similar pair sell on ebay for $1,500. 0 Response to "Golf's #1 Player Still has Heroes"